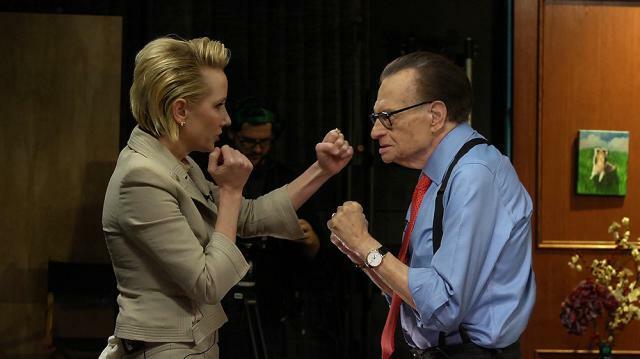 Why's Anne Heche punching Larry King during an interview? Emmy nominee Anne Heche gets Larry King out of the interview chair for an impromptu lesson in landing a fake punch for the big screen cameras! Anne Heche: Working with Johnny Depp was "heaven"
Would Maura Tierney do an ‘ER’ reunion? Larry King: How do they choreograph those fights? Larry King: Like when you’re punching at the chin, what do you hit? Anne Heche: First of all, in order to make it look so raw, obviously neither one of us are fighters and neither one of our characters are fighters, the more it was detailed, the better the fight became. So our fights were choreographed, we do three—not to give anything away—we do three major fights, they’re all very different, they all take place in different locations. The first one very confined in a stairwell, the second in a tire shop in Brooklyn, that was a fun one, that becomes more about weapons and tools. Every fight becomes more and more extreme, the third fight is more about nature and using sticks and rocks, and they’re real dances of rage basically. Anne Heche: Sorry, I didn’t answer your question. Anne Heche: [punches air] You aim for the ear. Right, I’m going to aim for your ear. Right, not your nose. Larry King: Aim for my ear. Anne Heche: Oh it looks like we’re cracking a lot, it’s just like when you hit somebody in the gut with your knee, you’re hopefully not going to hit them in the gut, you know, you want to be about an inch away. Anne Heche: Do you want me to try it? Do you want to do it? Anne Heche: Yeah? Kay, come here. Larry King: You gonna hit me? Anne Heche: Well, I’ll hit you and then you hit me. [Adjusts Larry’s position] So the camera’s over here, right, now I’m gonna come at you. Larry King: Don’t hit me. Anne Heche: I’m gonna try not to…tempting. Okay, I know you don’t want to look at me like you don’t like me, but you’re gonna have to try. Larry King: I like you. Anne Heche: Now, okay, I’m gonna come at you, but you’re gonna watch me, I’m gonna look you in the eye, and when I come toward you, where’s your face gonna go? [She mimics punching his face] So if I go 3, 2, 1, go. [She mimics punching his face] That’s not very good. You’re not selling it at all. [She readjusts his position and his fists] Now you’re gonna try to hit, you’re gonna go 3, 2, 1. [Larry mimics punching and she stops his fist] You’re gonna count first, and look me in the eye, ready. Larry King and Anne Heche: 3, 2, 1. Larry King: Now when it goes on screen, they will hear a crack of me hitting you. Anne Heche: Well heck yeah, okay try it again, ready. Larry King: I’m getting turned on here. Anne Heche: 3, 2, I know, I’m trying, it’s been a long time, you’ve married a lot of women, but never me. Ready? 3, you can’t look that way, you’ll get hit. Ready, 3, 2, 1. [She mimics punching Larry’s face, and he mimics recoiling] Boom. [She mimics hitting the left side of his face with her right arm] If I hit you this way, which way do you go? Larry King: [points to his left] That way. Anne Heche: [puts fist on Larry’s chin and pushes him back] No, you go that way, like in real life. Anne Heche: [puts her fists up] Okay, ready. 3, 2, 1, go. [She mimics throwing a punch at Larry’s face, then looks exasperated] Dude! Larry King: All right I failed. Anne Heche: [releases him and returns to her seat] That’s right. Now you get the idea, do that for a few days. Then you’ll understand what Sandra and I felt. That was fun. You can try that at home later. Larry King: I’m taking her home with me.